Thanks to a $3.5 million gift from the C.B. 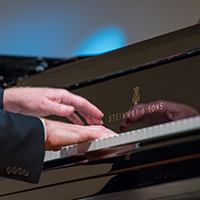 Frevert Family Trust designated for Illinois Wesleyan's School of Music, aging pianos will be replaced with instruments of the highest quality, and Illinois Wesleyan will become one of 153 universities in the world to earn the distinction of being an All-Steinway School. The 32nd Annual Juried Student Art Exhibition and the Senior Art Exhibit will take place Monday, April 8 through Wednesday, April 24 at Illinois Wesleyan's Merwin and Wakeley Galleries. These exhibits will display the finest works from graduating seniors and an array of pieces celebrating all aspects of the art program. Dogs from a local rescue shelter will be available for Illinois Wesleyan University students in need of friendly barks and wagging tails this Reading Day, April 24, from 10 a.m. - 2 p.m. on the main quad. The number of college students seeking help for mental health issues is increasing at area universities, and Illinois Wesleyan is among those offering a variety of stress-relieving activities and workshops to promote positive mental health. The inaugural “Arts Slam,” organized by faculty and students from the schools of art, music and theatre, featured a series of events to bring arts to public spaces on campus. Illinois Wesleyan University students will present their research projects at the John Wesley Powell Student Research Conference, with documentary filmmaker Renèe Scheltema as keynote speaker. 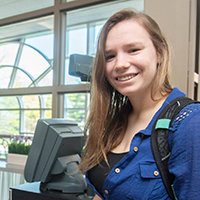 Illinois Wesleyan University far exceeded its $400,000 goal for its “All In for Wesleyan” fundraising day on April 11. IWU Pride Alumni participation was featured in the Illinois Eagle. As longtime sportswriter Dave Kindred ’63 covered his 52nd Masters, author John Feinstein noted "Dave can write well and passionately about anything" – and nothing better than golf. Netflix announced it will adapt the Broadway musical The Prom, co-produced by Bill Damaschke ’85, into a feature-length movie.